How Long Will it Take to Get an MBA Online? With the prevalence of online MBA degrees, many people often wonder how long it takes to receive an MBA degree online. Typically, students will find themselves in a two-year program if they are dedicating themselves to full-time study. However, there are other online MBA degree options available for students with varying needs. Some professionals wish to obtain an online MBA in the shortest amount of time possible, while others decide on a less demanding schedule. Thankfully, there are online MBA programs that cater to every individual’s specific needs. There are over 5,800 MBA programs throughout the United States, according to mba.com. Much to the joy of students who are eager to earn their MBA and advance in the professional world, a number of the programs offered are Accelerated MBA programs. Rather than experiencing regular break times, students in an Accelerated MBA program are delivered course material on a much more rapid and intensive basis. This means that students in these programs cannot enjoy the same break times as others, but their effort is rewarded by being able to receive their MBA degree much more quickly. Most institutions have different degree requirements, thus the average graduation times vary. Many universities are able to provide students with an Accelerated MBA in less than 18 months, but this time frame tends to vary depending on the number and duration of breaks that they provide their Accelerated MBA students. Many students often find that their summer break is shortened to just a few weeks, rather than having months off. Therefore, anyone considering enrolling in an Accelerated MBA program should be prepared to fully immerse themselves into the course material for at least one year. Professionals who have demanding work commitments and are unable to commit to the course load of a standard online MBA program can continue their academic progression through an online EMBA program. The Executive MBA program has been specifically tailored to meet the demanding needs of busy professionals who are unable to take on a full academic workload. Typically, an EMBA program is only available to those who currently hold management or executive positions and possess a significant amount of industry experience. The program has the exact same components as the standard and Accelerated MBA programs, but it provides students with a much more relaxed pace, allowing them to focus equally on their professional and academic lives. Most students are able to finish their EMBA in 36 months or fewer. Numerous universities now offer Dual MBA online degrees as well. These programs are specifically designed for students who would like to combine business courses into their master’s curriculum. Some common examples of Dual MBA degrees include a Master’s of Public Health degree or an MBA with a Juris Doctor. However, there are numerous options available. Many students believe this degree path will take much longer to complete, but this is not the case. A Dual MBA can usually be completed in two years, which is the same amount of time it takes to receive a standard online MBA degree. 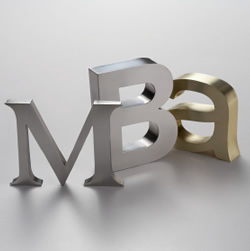 For aspiring business professionals, an MBA is an integral step in furthering their careers. For many people, it may seem difficult at first to obtain an MBA while maintaining employment in their current profession. Fortunately, there are a variety of online MBA programs that can provide the flexibility they need to maintain their professional lives and earn an MBA at the same time.